I’m squeaking this post in while it’s still April. Nothing like taking forever to transfer photos from my camera to my computer. I’m such a procrastinator. This meeting was 2 weeks ago, and it was a good one. It’s always interesting to learn a new technique, and to be inspired by a stellar Show and Tell. She has a wonderfully, clean approach to her work, and it’s always a joy to see what she is creating. The purple circle piece was started at a Fiberista’s meeting, and after all the stitching, she got brave and sliced into that heavily stitched piece. It looks so good against the background. Her judicious editing really worked well for this art quilt. And the leaf quilt – what can I say about leaves? I love them. Any size, any color, any technique. I love that bracelet. 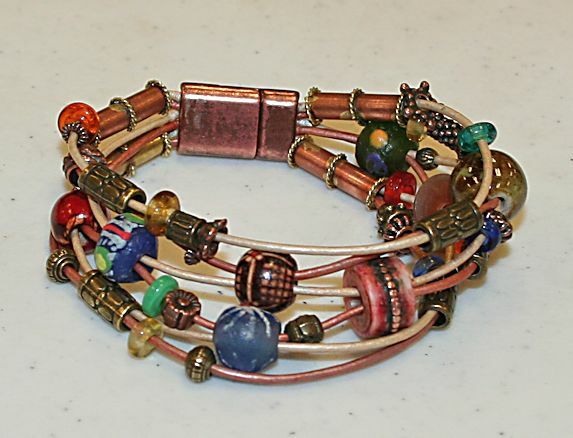 The mixture of beads works so well in that bracelet, and this is the first time I’ve seen 2 different color leather cords used this way. I definitely need to get out more. It’s been pretty rainy here lately, and my getting out of the house mojo is missing. Where oh where has the sun gone??? 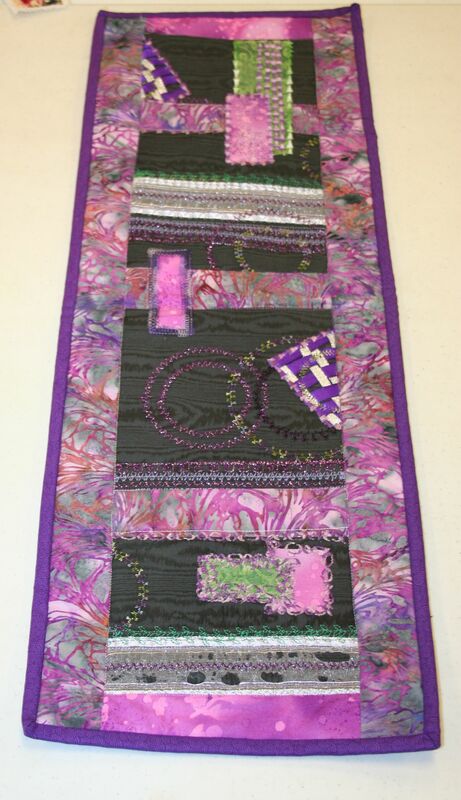 Happily, I attended my local quilt guild meeting beadless. Dianne Hire was the guest lecturer, and she brought a lot of her quilts for us to see. They are absolutely stunning, and we were allowed to take photos, but not post any of them on our blog. 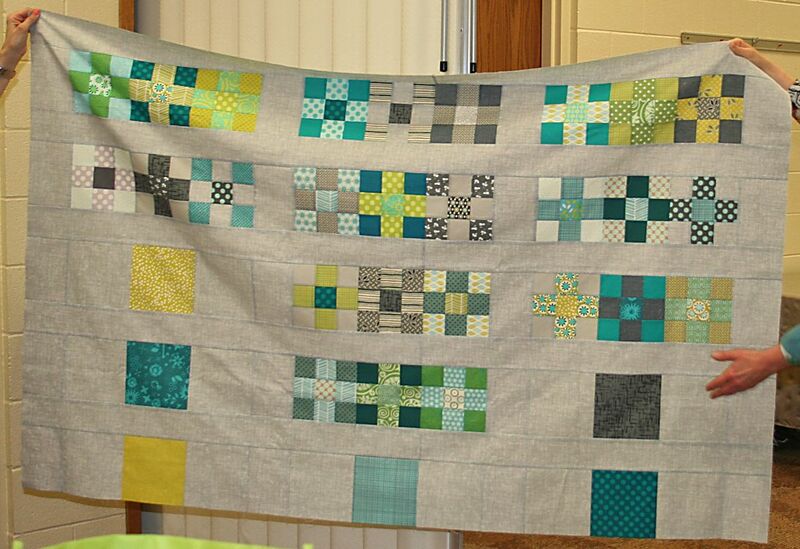 While I can’t share those photos, I can of a couple of quilts from Show and Tell. She woke up one morning, looked at the Persian carpet under her feet, and thought to herself, this would make a wonderful quilt. 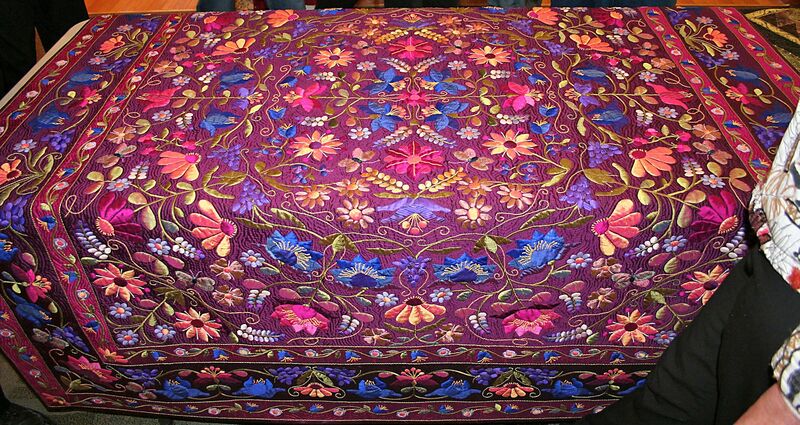 She loves working in silk, and her version of a Persian carpet became a reality. Please double click on that photo, and I hope you will be as impressed as all of us were. Again please double click on this image. She created a lot of that fabric herself. Can you find the shibori?